Can Donald Trump overcome his new scandal? Is Trump sorry? The new Trump scandal is guaranteed to loom over the debate, but no one is sure how Trump will play it. Will he appear genuinely apologetic or will he double down on his "locker room talk" defense? CNN thinks Trump can survive if he comes off as "sincere." Will Trump go after Bill Clinton? Trump has hinted he might open the floodgates on Hillary's husband. ("Bill Clinton has said far worse to me on the golf course—not even close," Trump said, per the Los Angeles Times.) While Trump has several lines of attack he could open on Bill Clinton, attacking a woman over her husband's infidelities could backfire. Vox breaks down the ways this strategy could go "horribly wrong." How will Trump come off in town-hall style? That's the question Politico and many others are asking. Trump has seen success in the past by overpowering debate moderators and talking over his opponents, but those strategies might not come off so well if employed against regular, working-class people. Hillary Clinton's Wall Street speeches: Long a topic of shadowy campaign allegations and a symbol of Clinton's perceived cozy relationship with the 1 percent, the New York Times says the transcripts of Clinton's private speeches to bankers "Show a Hillary Clinton at Ease With Wall Street." Expect Trump to fully highlight the release of these speeches, which has been largely overshadowed by the discovery of Trump's remarks. 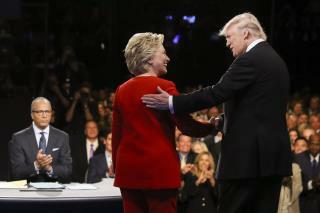 Trump is likely to seize on Clinton's advocacy for a worldwide free-trade zone, given his propensity for attacking Clinton over her support of trade deals including NAFTA and the TPP. How hawkish will Clinton get over Wikileaks? NPR wonders how far Clinton might go in linking Wikileaks to Russian intelligence services, which have often been accused of trying to sway the election in Trump's favor. Wikileaks released the speech transcripts and lots of other damaging material this election cycle. If Clinton chooses to aggressively link Russia to the hacks, it could highlight Trump's alleged links to Moscow. The Guardian has more on that front. what locker room does donald hang out in , were men brag about sexualy assaulting women ? There are more of those recordings of Trump coming, so any apology can't sound too sincere.